Oh, I have the most wonderful cottage to share with you today! It’s a dream cottage in every sense of the word. 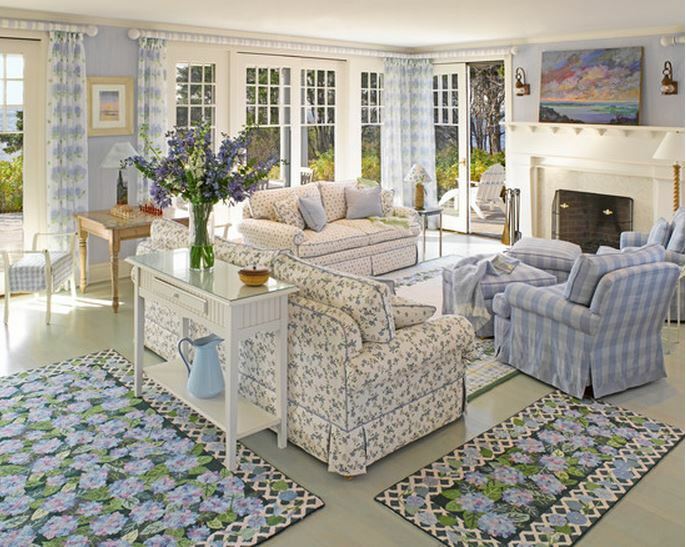 The interiors were designed by Donna Elle and the colors and fabrics she used are so beautiful! I was so excited to see that you can actually purchase some of the fabrics, rugs, pillows and accessories she uses at her website. How often do we oooh and ahhh over a gorgeous home but struggle to get the look in our own homes. So, I was thrilled to see so many of the textiles and accessories are actually available to purchase! One of the things I noticed right off the bat about this lovely seaside cottage is the interiors are not done in the typical nautical blues. 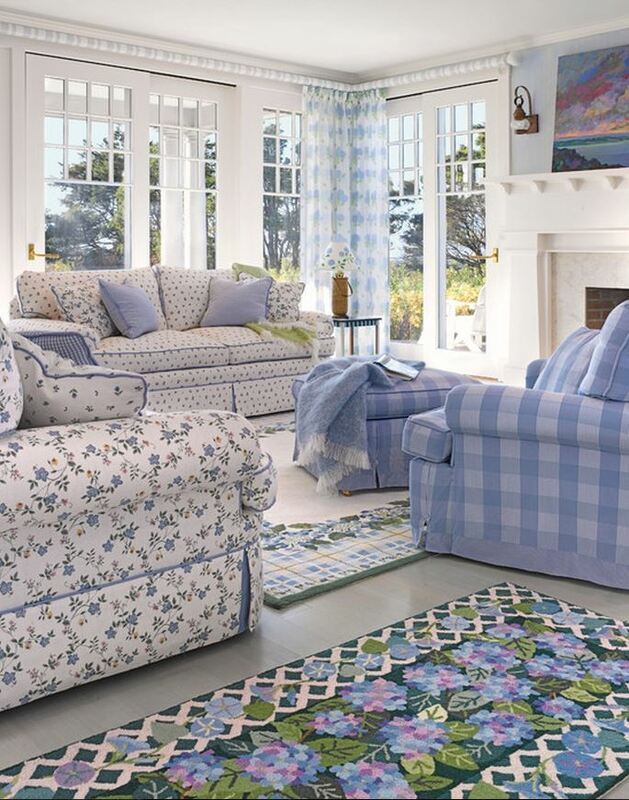 Instead, you’ll see a lot of beautiful florals done in soft blues and lavenders. 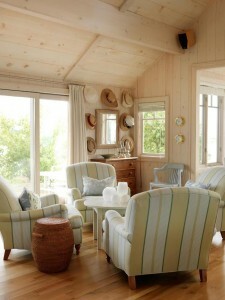 This living room would look at home in any cottage, not just one that’s on the beach. I love the blue plaid on the chair and ottoman. Or, is it periwinkle in color…kind of hard to tell in the picture. Notice how the sofas have been covered in a smaller floral print. It’s so much fun to mix patterns in a room and it’s really easy to do when the scale or size of the patterns are very different, as seen here. 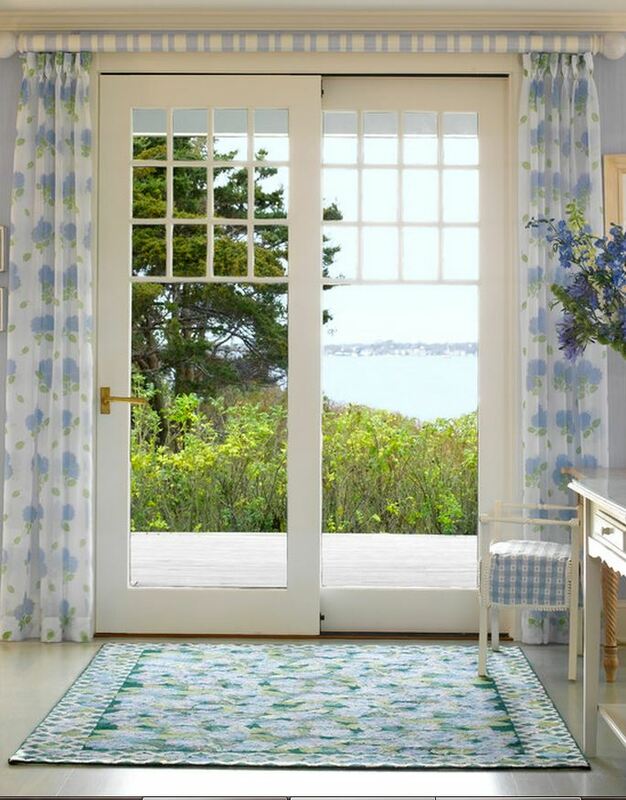 Love, love, love the fabric used for the curtains on either size of the French doors. So light and airy! Don’t you know they look beautiful swaying the ocean breezes. We see that same fabric repeated here again in the shade of the lamp. The lamp base reminds me of the wonderful handmade baskets found in the Nantucket area. I love this kitchen so much! Aren’t the windows just perfect! 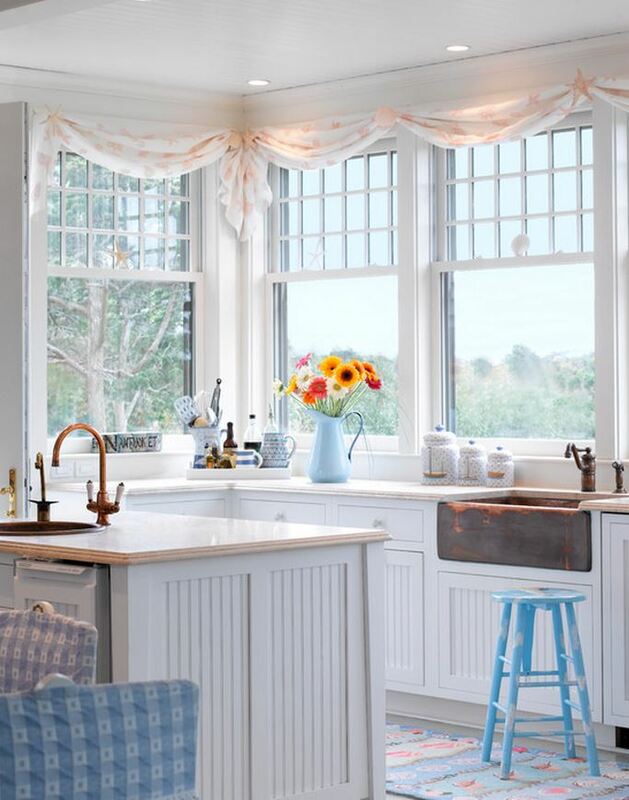 I love windows with mullions and these windows give you the best of both worlds with the mullions at the top and full open views on bottom, so perfect for a beach cottage where you don’t want anything to impede the views. Notice the fabric and the darling starfish swag holders. I’m pretty sure I saw the fabric available at Donna’s website. I love the rustic look of the sink against all the white cabinetry. I would never want to leave this kitchen! Can you imagine waking up and coming down to this kitchen in the morning! I’m not a morning person but this might turn me into one! 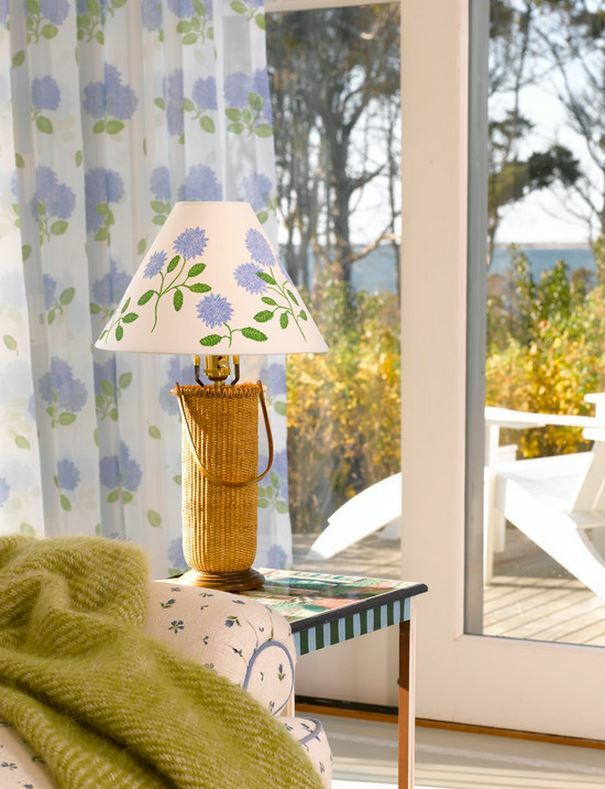 The bedrooms are just as wonderful as the rest of this seaside cottage. Notice the sky blue ceiling. The fabrics in this room are so soft and so pretty! I noticed this fabric available at Donna’s site, also. I just want to stare at this scene ALL. Day. Long! Sooo dreamy! We don’t get a full view of this room but I’m guessing it might be the master since it has its own fireplace. I love that over-stuffed seat cushion in the wicker rocker. That is what all seat cushions aspire to be when they grow up! 🙂 Notice the fabric used for the pillow in the rocker…the next picture will show a close up of it. They took the pretty green leaf design in the curtain fabric and pulled it out for the pillow fabric. Love it! 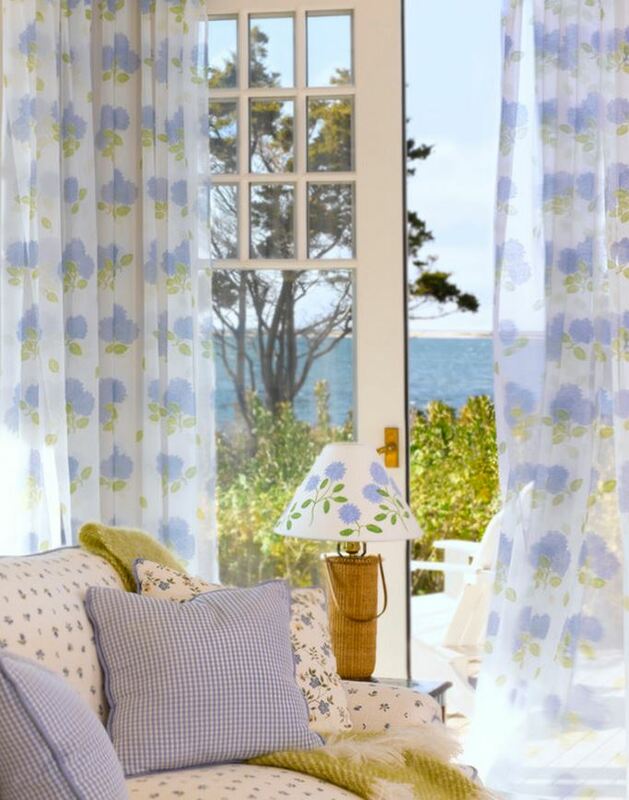 You can see more of Donna Elle’s designs and purchase these beautiful fabrics at her website here: Donna Elle Seaside Living. Many of the fabrics, rugs, pillows and accessories we saw today are available under the category “Shopping” at her website. By the way, this isn’t a sponsored post, I’m just excited to see the fabrics are actually available for once! So rare to find that…wish more designers offered it! I would love to see a porch done in grays yellows and white. This really is gorgeous and dreamy-looking, Susan!! One of the prettiest homes I’ve seen in a long time. I love all those soft, sheer fabrics and they’re my kind of colors. So pretty and fresh! Love it. Dreamy is the best way to describe it. Be still my heart! I am in love! This is the most comfy/cozy settings ever. I just want to plop down on a sofa and breathe in the salty ocean air! 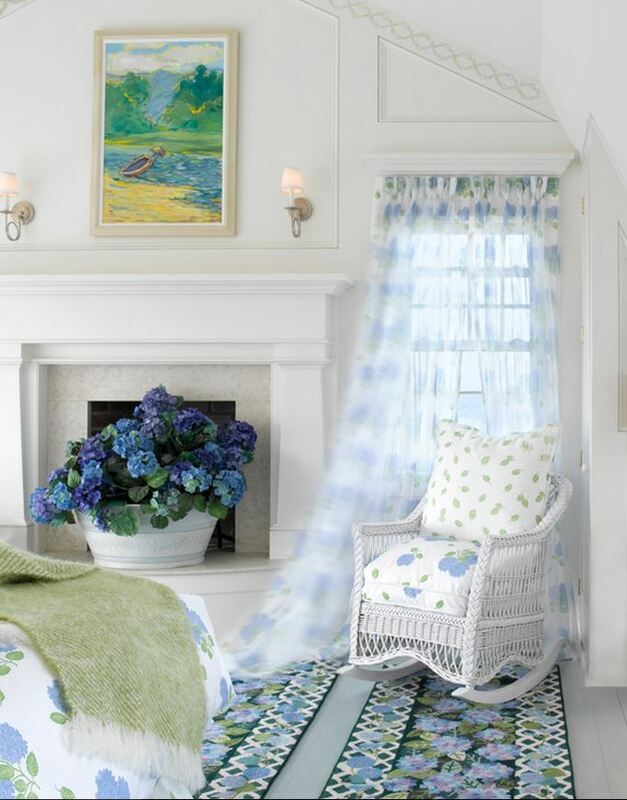 I love the use of the hydrangea design in the curtains and such but especially in the rugs. The two rugs in the living room are beautiful. Would someone please kidnap me, lock me up in this beach cottage and throw away the key!!!!! What a gorgeous beach house! Despite the many layers of textile designs and patterns it still manages to invoke a sense of cool relief from the heat of the summer and yet it still maintains a cottage’s warmth and coziness. I too love the soft periwinkle plaid chairs! The bedroom with the yellow and white horizontal striped walls and pale blue ceiling is just beautiful. The curtains throughout are so soft and breezy. I love the kitchen design and those spectacular windows! The entire home looks like a fairytale by the sea. Thanks for sharing – definitely pinning this one! I too love your blog! The interior, furnishings and colors/textures are so fresh and delightful. I could move right into this one too! It is relaxing just to look at the photos, can’t imagine how relaxing to really be there. Very sweet and very girly. Not for a man to enjoy. I know my husband would not care for the decor. Pretty cottage just a little to feminine. Absolutely beautiful. The colors and décor lend to such a feeling of calmness. thanks for posting. What a gorgeous home! Love all the light and airy colors. After a day on the beach, this is the perfect cool off spot. Lovely! Love the cottage! I live in a cottage style home and I was pleased to see the mix of patterns. My Bernhardt sofa is a tailored washed velvet stripe in taupe, sage and light brown. The Lee club chairs are covered in a linen Jacobean print in taupe, blues, green, and brown. A large tufted Lee ottoman in a taupe and ivory nubby leopard print centers the group, with a taupe and ivory medallion print wool rug underneath. The muted tones just seem to work together and the sofa fabric adds a masculine touch. I worried I had too much pattern, but a cottage seems to thrive with it! Wow! what a treat, you really hit it out of the park with this one Susan! I simply love the colors and the lovely wispy curtains. Susan, what a pretty cottage, I could just settle in there. I love the floaty ethereal feeling of all the fabrics. I must check her site out. Did you notice how the living room curtain poles were painted? Someone noticed that, but I had not. They’re pretty, aren’t they? Looks like they have stripes. We were wondering if they are fabric covered but I think they may be painted. Love it all especially the hydrangea rugs! I am moving in!!! Wow Susan! I seriously love this! It’s dreamy! I can tell these are your colors, your upstairs family room has the yellow and blue. I think I would really be torn with going to the actual ocean and getting my toes wet or staying in that beautiful house. 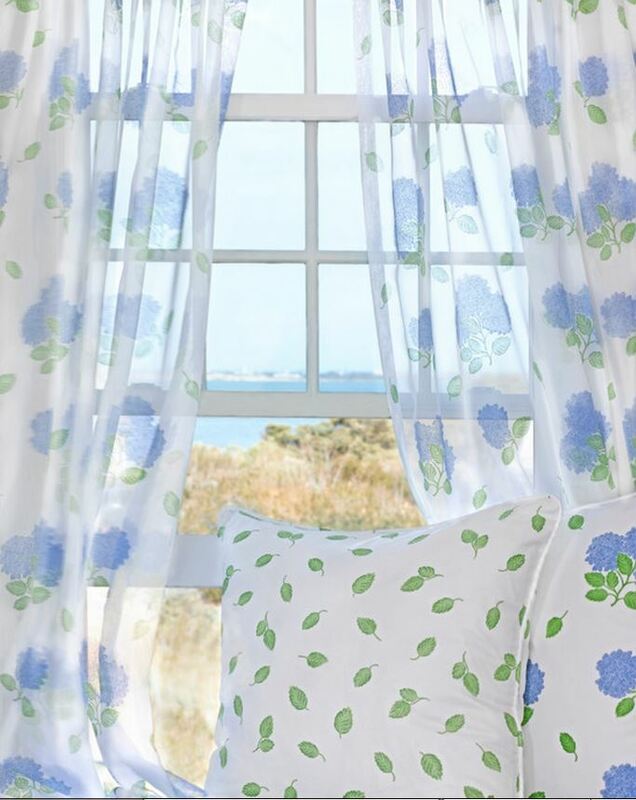 Oh, this is so very pretty and perfect for the seaside…..nice and cool on those hot, humid days!! This is so me…..I could move right in…..no problem!!! The rugs are exquisite and this is such a beautiful and original house.Thank you!! Does anyone ever wonder how these beach houses never have mosquitos? Why can’t I, here in Virginia Beach (15 min drive to the oceanfront), leave all the windows open, doors open without screens? If only I knew the answer. Maybe my answer is I need to move to the beach!!! Yes that it! Selling all my things and buying a beach house. Oh, this IS dreamy. The rugs look like Claire Murray. 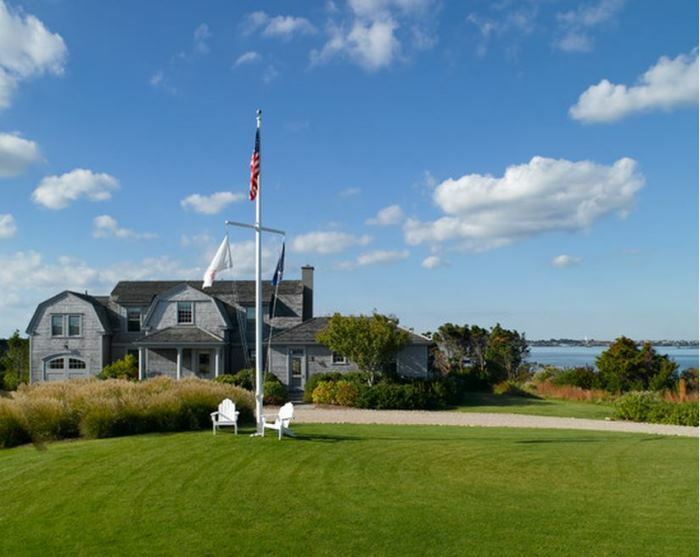 When I win a huge lottery (I don’t play the lottery), I’m going to have a house like this in Nantucket… Thanks for this gorgeous post. This house IS so dreamy! I think I have seen this house in one of Claire Murray’s catalogs. The rugs look like hers. Thanks for the lovely post. Oh my, I don’t know where to start with what I like the most about this beautiful cottage! I am so excited to be moving into a Southern Coastal style home the end of May. Unfortunately I won’t have a view like this little cottage, but I could sure eventually re-create a kitchen that is as pretty as this one. The colors are beautiful, all the pretty blues, and I love the soft yellow desk and chair. Thank you so much for sharing this pretty little place. Takes me straight back to Laura Ashely of the 80’s. Bring on the florals.! Wow! This is beautiful! I love the blue/lavender/periwinkle colors. Not so fond of the yellow, but if someone wants to gift this cottage to me, I promise not to complain. I LOVE the rugs! I’d love to see a detailed picture of the painted end table in the livingroom. I love this! Would anyone know where to find the furniture? I have been looking for a sofa and either one would be perfect.